Just like other semiconductors temperature may affect efficiency of solar panels. There can be a decrease 0.5% in silicon panels & 0.25% in amorphous solar panels with every 1% change in the temperature. In some cases the efficiency can reduce from 10% to 25% depending upon specific locations. Temperature effects are the result of natural characteristic of solar cells. As temperature increases, the band gap of solar panels decreases and hence effecting thermo- dynamic qualities of solar panels. The decrease in the band gap of a semiconductor with increasing temperature can lead to the increase in the no. of electrons in panels. Since electrons are in excited state lower energy is needed to break the bond. 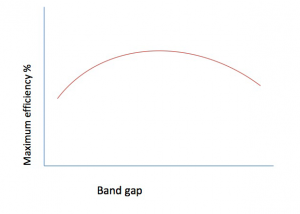 In the bond model of a semiconductor band gap, reduction in the bond energy also reduces the band gap. 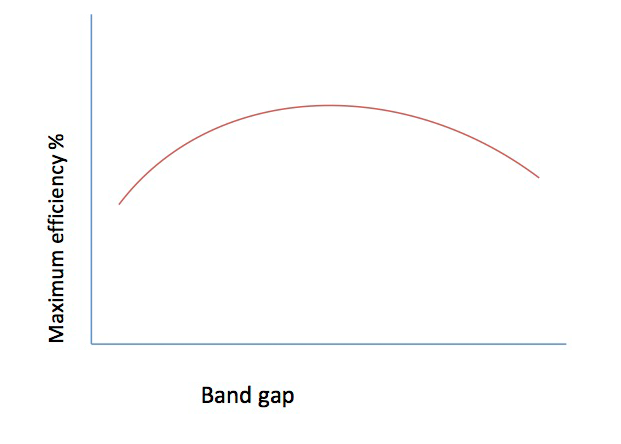 Therefore increasing the temperature reduces the band gap. The difference of I – V characteristics of solar panels can lead to a decrease in the overall efficiency. The above graph shows Shockley–Queisser limit i.e. maximum efficiency of a PV cell using a p-n junction to collect power from the cell. The limit places maximum solar conversion efficiency around 33.7% assuming a single p-n junction with a band gap of 1.1 eV for a silicon cell. When exposed to sunlight, photons in the sunlight strike the electrons in p-junction semi- conductors which turn electrons into excited state. This process of excitation of electron is called photo-excitation. In silicon modules, photons have enough energy to push an electron out of the lower-energy valence band into the higher-energy conduction band. When a load is placed across the cell as a whole, there is a movement of electrons from p-junction to n-junction. Then again get back p-junction to produce lower energy photon. This is how current is produced in a cell. Since moving from one valence bond to another valence bond requires energy so only those elctron with higher energy will produce a photon. This sets an immediate limit on the amount of energy that can be extracted from the sun. The solar panel temperature affects the maximum power output directly. As solar panel temperature increases, its output current increases exponentially while the voltage output is reduced linearly. Since power is equal to voltage times current this property means that the warmer the solar panel the less power it can produce. The power loss due to temperature is also dependent on the type of solar panel being used. Typically, solar panels based on monocrystalline and polycrystalline solar cells will have a temperature coefficient in the –0.44% to -.50% range. And show much greater variations in output. Amorphous panels can have temperature co-efficient near –0.34% making them a better choice for peoples living in places with high temperature zones. In order to reduce the power loss and decrease in efficiency it is necessary to have additional cooling systems for solar panels. They may insure the hybrid bonding of p-n junctions and greater efficiency of the panels. Now a days the mounting systems comes with technology to automatically prevent the Solar power systems from the excess heat or temperature rise. Thin film modules have greater efficiency in comparison to silicon modules hence can be used for greater efficiency instead of silicon PV’s . While installing the solar panels one should make sure that there is a gap left between rack and panels hence allowing the circulation of air for natural cooling process. Inverters and power systems with Maximum Power Point technologies (MPPT) technologies can also be effective. MPPT is used to increase the output of the solar panels by providing optimum power supply by using solar charge controller . By increasing the resistive load on the solar panel one can increase MPPT factor of power system. Another method of increasing solar cell efficiency is increasing the Fill- factor of cells. Fill- factor is the ratio of available Maximum Power point by the voltage in the open circuit and short circuit. It can be increased by increasing the shunt resistance and decreasing the series resistance.